Chord melody is a highly sought after skill by many guitarists, and it’s easy to see why. Being able to play melody and chords on a single instrument has immense creative possibilities in both trio and solo guitar situations. But, if you’ve tried to learn chord-melody, it’s likely you’ve been overwhelmed. There are so many approaches to chord melody that you’ve probably found yourself scratching your head from information overload. This is where this lesson comes in. In this lesson, you’ll learn four essential tricks that you can use to create chord melody arrangements that sound great and are easy on the hands. Let’s get into it! This is a preview of our eBook The Complete Guide to Chord Melody and Chord Soloing. In this lesson you’ll create a chord melody for the standard Back Home Again In Indiana. The first step to chord melody arranging is to learn the melody on the top 2 strings, where possible. This enables you to fit the chord voicings underneath the melody line. You’ll probably have to shift the melody up an octave from what’s written to be able to do this, and you may also need to change the key to suit the range of the guitar. In the case of Indiana, this melody already sits well on the fretboard in the original key of Ab major, but I’ve shifted it up the octave compared to what you would see on a lead sheet. Here’s the result – your first mission is to learn this melody on the top 2 strings. You don’t need to add chords to every melody note for a chord melody. This way of thinking trips up many aspiring chord melody guitarists. They think that an effective chord melody needs to have every melody note harmonized with chords. Though this is one valid approach to chord melody, it’s an advanced skill requiring extensive knowledge of chords and a high level of technique. You can still create a great sounding chord melody by adding chords here and there to the melody line – Joe Pass’ chord melodies are a strong example of this. In fact, this ‘less-is-more’ approach can actually sound better compared to harmonizing every melody note. Phew – glad we got that cleared up. Lenny Breau was a chord melody genius. You might be surprised by how little Lenny is doing with the chords under the melody line. To put things in context, Lenny’s approach to chord melody was how a pianist would play, with the ‘right-hand’ playing the melody and the ‘left-hand’ playing the chords. Seems easy enough, but there’s a challenge with this approach on the guitar. The fretting hand needs to play both the comping and the melody at the same time – a near impossible task. Lenny’s solution around this issue was to pare down chords to their most essential tones, thus freeing up more fingers to play melody notes. The 3rd determines if the chord is major or minor. 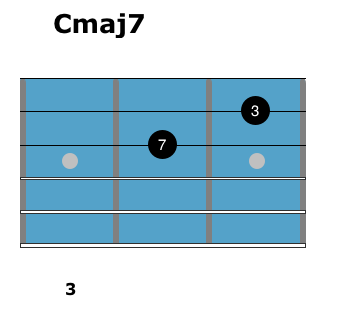 The 7th determines if the chord is Maj7, dominant 7, or m7. Even the root can be omitted and the chord will retain the given harmony. This is particularly true in a trio context – as the bass player is playing the root notes. You may think I’m crazy suggesting that this sounds enough like a CMaj7 to work in a chord melody. Before you hit the back button on your browser, play the following exercises, and you’ll see what I mean. Here, you’ll play the 3rd and 7th for each chord in a C major ii – V – I progression. Play this along with the backing track provided. As you can hear, the 3rd & 7th voicings convey the underlying harmony perfectly in this trio context. Now, practice the same exercise, but this time over a minor ii – V – i progression. As was mentioned above, 3rd & 7th voicings are effective with chord melodies because you only need two notes for each chord, leaving more fingers available to play the melody. The result? Chord melody playing becomes much easier. Here’s the first half of Indiana, with 3rd & 7th voicings added underneath the melody line. Right away you have a cool-sounding chord-melody arrangement, without any further work needed. Did you notice how some melody notes have only one note added underneath, rather than two? In those instances, the 3rd or 7th was already in the melody, so there’s no need to double up on a 3rd or 7th if it’s already there. Also, notice that because these chord shapes are easy to play, you can quickly move between voicings while holding a sustained melody note – a neat effect. Although the 3rd & 7th voicing trick is a complete chord melody approach in itself, it might start to sound a bit samey after a while. So, let’s delve into more easy chord melody techniques that bring variety to this arrangement. While diatonic harmony is built by stacking thirds, quartal harmony is built by stacking fourths. The 6/9 shapes pictured here are examples of quartal voicings. Quartal voicings are often tonally ambiguous – they have an open sound that can imply a wide range of harmony. Ironically, this makes them useful for chord melody arranging. Although they’re not ‘textbook correct’ in outlining the harmony of a given chord, they imply the harmony enough to make sense to the listener. They’re also easy to play, as 5 out of 6 strings are tuned in fourths. Generally, quartal voicings are effective if they’re harmonizing the root or fifth of Maj7 or 7 chords. But, there are many other possibilities with quartal voicings, so experiment and see what you come up with. Compare the sound of these voicings to the 3rd & 7th voicings from earlier. Although you may not use quartal voicings for every chord, they’re a solid choice to create variety while keeping things easy on the hands. If you have half-step approach notes in the melody (notes one fret above or below another melody note), chromatic approach chords are an excellent choice. To keep things simple, chromatic approach chords will be referred to as approach chords in the text below. An approach chord is where you play the same voicing of the target chord one fret away. In the next example, I’ve harmonized a section of Indiana with 3rd & 7th voicings but I’ve noted a few half-step approach notes in the melody. The three tricks you’ve covered so far enable you to arrange any jazz standard into a workable chord melody. Similar to quartal voicings, dim7 chords imply many possible harmonies with one shape. They’re also easy for the fretting hand to grab – bonus! 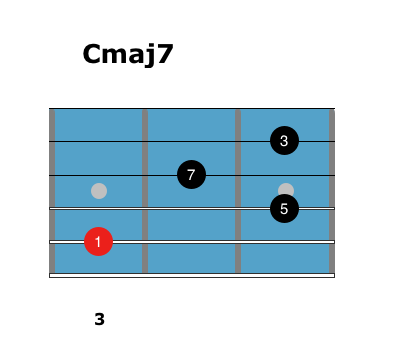 Dim7 chords have many potential uses for chord melody, but the main one you’ll focus on here is using them to add tension to dominant 7th chords. Here’s how to play dim7 voicings on the top two string sets. If the melody note is a b9, 3, 5, or b7 of a dominant 7th chord, you can use a dim7 chord shape with the melody as the highest note in the chord. This sounds a 7b9 chord. For example, if you have a bar of F7 with an A in the melody, since A is a 3rd of F7, you use a dim7 shape with A as the highest note. This sounds as an F7b9. Check out the example below where there’s a dim7 chord over F7, and a few other bars as well. The following arrangement of Indiana demonstrates all the techniques covered throughout this lesson in combination. In the video at 14:49, I demonstrate how you get the arrangement to swing more by increasing the tempo, playing with chord placement, including chromatic approaches and jazzing up the melody line. Voilà! With these 4 chord melody tricks, you now have a toolset to arrange any standard into a chord melody, with minimum stress. Greg O’Rourke is an Australian jazz guitarist and holds a Bachelor of Music (Hons) from the Australian National University. He’s the owner of www.fretdojo.com, which offers lessons and eBooks on how to master jazz guitar, with a focus on chord melody and solo guitar. Any chance of getting the pdf on this one? As usual this is the best place to learn jazz with all these great infos at the tip of my finger. Thanks for taking the time to share these great tips. Glad you enjoyed the lesson Andy! Thanks for the lesson, I am playing out of my pay scale, but I really enjoyed following along. Thanks Andras, to get these tricks under your fingers, especially those 3-7 voicings, just take them at a super slow tempo to start, once you get the 251 patterns clear in your mind that will create a good foundation for developing these techniques. The best quick start you can get for chord melody playing and it’s for free! Fantastic work! Thanks Antonio! I am very humbled by all the positive feedback here. Subtitles are blocking the tabs. Can’t see the tabs. Hey Kevin, you can click the “CC” button on the video menu to turn off the subtitles so you can see the TAB. Your lesson is well crafted and addresses a much needed aspect of jazz guitar. I can’t wait for your new e book. Thanks Nicolás! Glad you enjoyed this one. Yes we’ve been having a lot of fun working on the latest project together, we’re really looking forward to sharing the book with you guys. As usual, this lesson is outstanding. The clear, precise, and easy to comprehend concepts you and Matt share are invaluable. Thank you so much for making a difficult subject less complicated. Thanks very much for your feedback Mark, great to hear you found this one easy to follow! I’ve got to say that this is the absolute best guitar lesson I’ve ever seen on-line. It answered so many of the questions that I’ve had about chord melody playing. You guys are simply the best. I’m sure I’ve not seen all the jazz guitar sites on-line, but I’ve been to a bunch, this is hands down the top of the list when it comes to applicable lessons. I can’t thank you enough for this lesson. OUTSTANDING!!! Thanks for the feedback Rodger – really happy to hear you enjoyed this lesson! Hola Greg! muy especiales tus lecciones…..realmente las aprecio y estoy muy agradecido!! Hi Greg! Very special your lessons ….. I really appreciate them and I am very grateful !! Very good CM tutorial, look forward to the new book. Trick 4 is brilliant! thank you much for the free lesson Greg! This tutorial was very useful. I applied the concepts to the tune Don’t Get Around Much Anymore. I had been playing a fingerbuster of an arrangement that I got online. I was motivated to create my own arrangement that was easier to play. I primarily used the concepts of shell voicings, and diminished shapes , both full and half, to create my own arrangements. 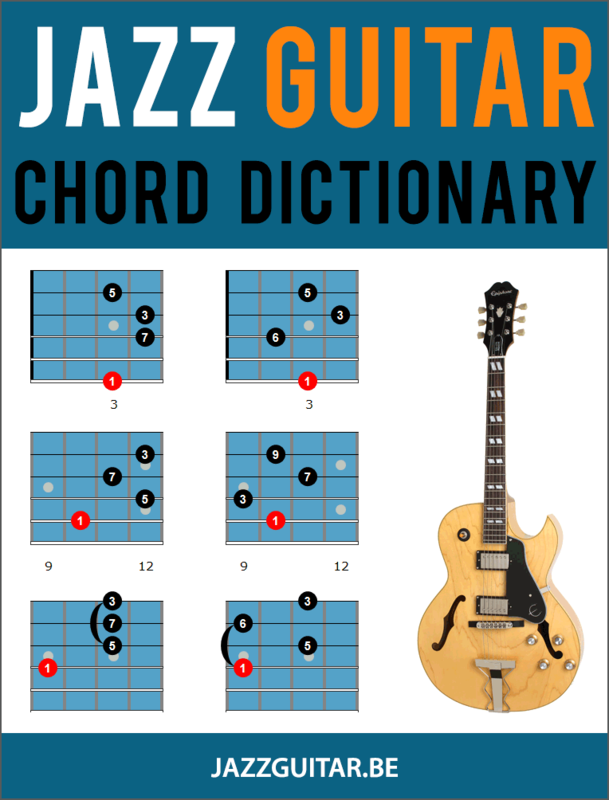 Another indispensible resource is the drop 2 chord diagrams on this jazzguitar site. The diagrams let me choose the best inversion from a choice of several over different string sets. The end result is an arrangement that I like better because it is within my skill to play at a reasonable tempo in order to make it swing. I’ll continue to work on the arrangement. Thanks for getting me started. My pleasure Rudy – great to hear that you found this article useful!